McCain shared his views on a wide range of topics vital to the audience of business and community leaders. U.S. Sen. John McCain speaks to an audience of business and community leaders Aug. 16 during the Greater Phoenix Chamber of Commerce Political Insider Series event. 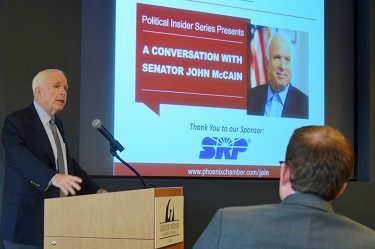 Arizona’s senior senator described the upcoming presidential election as “one of the most important in history” while urging an audience of state business and community leaders to be sure to get out and vote during the Greater Phoenix Chamber of Commerce (GPCC) Political Insider Series event Aug. 16. McCain struck a cautionary tone when discussing this year’s unprecedented presidential election. He urged attendees to get their fully completed ballots in, since the next president may appoint up to three new U.S. Supreme Court judges. Those judges’ influence will direct the court during at least the next two decades. “We Republicans have got to make the case of the importance of keeping the Senate in Republican hands…” he said. McCain’s Arizona pride showed through early in his remarks as he complimented the state’s robust, proud defense industry, one of his favorite topics. Speaking of Arizona points of pride, McCain also touted ASU President Michael Crow’s work, highlighting the school’s new Arizona Center for Law and Society building in downtown Phoenix, which houses ASU’s Sandra Day O’Connor College of Law. McCain pivoted from discussing the necessity of the North American Free Trade Agreement (NAFTA) to advocating for a Trans Pacific Partnership (TPP) that not only works for the United States economically, but also keeps China in check. When considering the recent actions of other nations including Russia and terrorist groups like ISIS, McCain sees a world in turmoil. But he reiterates that the United States is the world leader in combating forces seeking to do harm. McCain ended his remarks by reminding everyone why he has been reelected so many times as a senator representing the great state of Arizona. – Written by Josh Coddington, marketing and communications manager, Greater Phoenix Chamber of Commerce. This article is part of the Chamber’s Arizona in Focus newsletter.